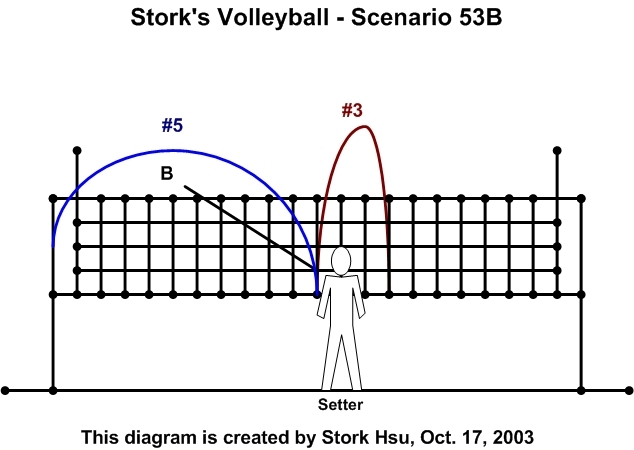 A team may play a 6-2 formation when you have 2 good setters and every players (including the setters) can hit the ball. In the 6-2 system, you always have 3 attackers in the front row, and your primary setter is always coming from the back row. The reason why it’s called 6-2, is that you have 6 attackers, and 2 setters. At 2004 NCAA Women’s finals, University of Minnesota was one of the team that played the 6-2 formation. Note that our codes maybe different than others if you are playing with American players. Remember the sets we talked about? #2 is one feet away from the setter about 4 ball higher than the net. #3 is the same like #2 only it’s behind the setter. These are based on the setter’s position at the time of the set, wherever the setter goes, #2 and #3 is next to the setter. 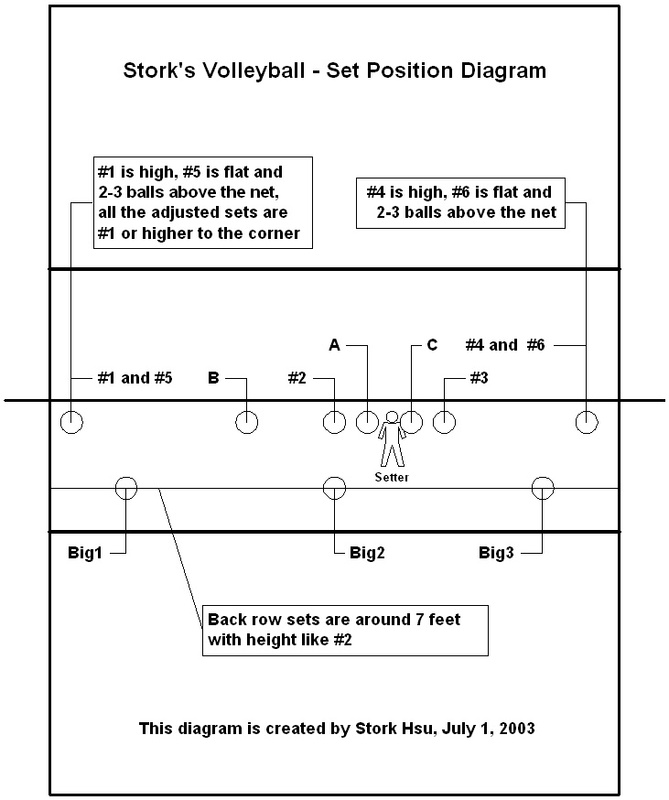 The key to this set is exact height and close to the setter. Timing to hit this set is to start your 3-step approach when the ball reaches the setter’s hands. Please check the diagram for more details on the sets. #1 is high and long to the left side for open hit, great for hitters who’s got hang time. #5 is a little lower than #1 and to the left for open hit. 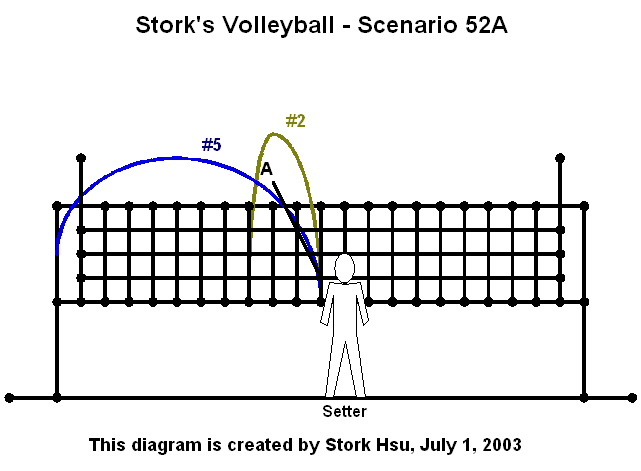 The advantage of #5 is it’s low above the net so the hitter has a wider range for the kill and avoid the blocks. 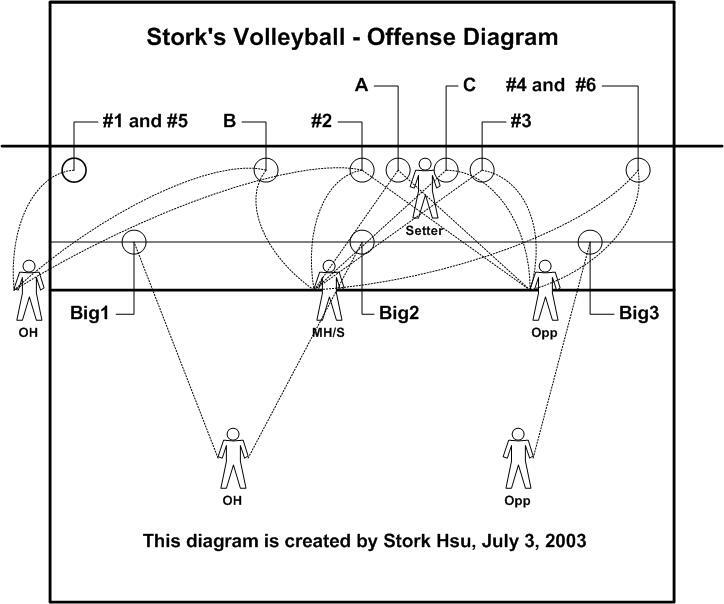 #4 is in the back of the setter to the right for open hit, while #6 is flat to the right side. For back row sets we add “BIG” to the codes, so we have BIG1, BIG2 and BIG3 respectively. For back row sets, we try to set the ball as high as a #2 set and keep the ball around the 7 feet range. (Please see “Set Position Diagram for more details.) 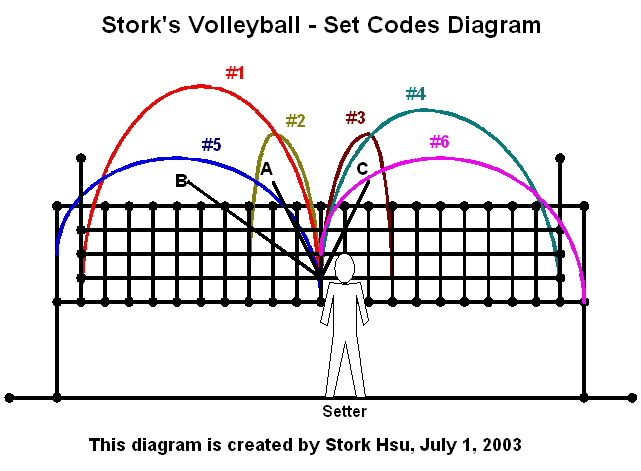 “A”, “B” and “C” are quick sets which we will try to play if we could get good return serves. 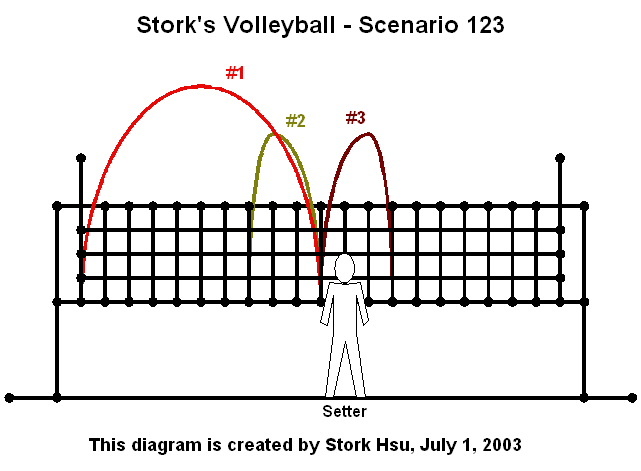 Reminder: The setter has to try his/her best to make a good set, i.e. pass the set parallel with the net and to the correct position. Be precise! The key is when we call sets (either the setter or the hitter calls before the serve), you know where the ball is going and you can prepare yourself and expect the ball to be there. The setters have the responsibility to put the ball to where it should be and the hitters have to get themselves ready to hit the ball. 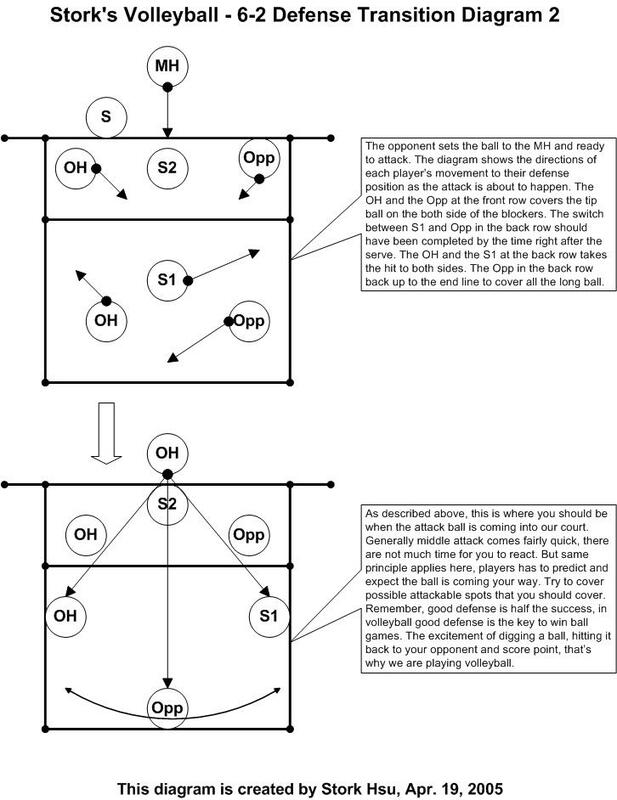 The hitter has to read the blockers and pick a set that could break their defense, trying to mix up the attack styles can always mean success in games. In a team that has good return serves, playing all the set combination became possible and very flexible during the games. 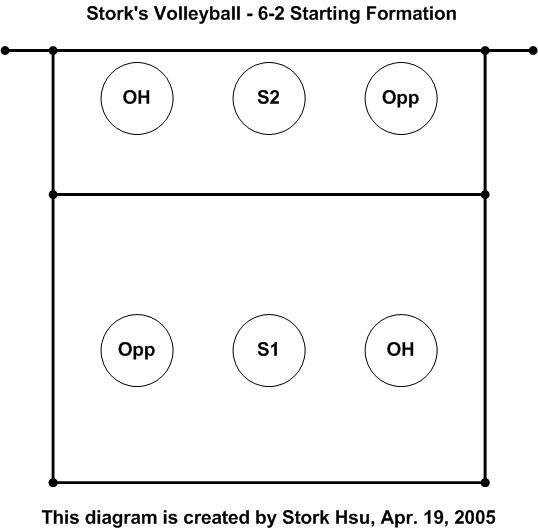 Following is the diagram for a 6-2 formation before receiving serves. As for defense, generally, we play center back, and the players on both sides go up for short balls and tips. The player behind the blockers has to go up to cover the tip ball behind and around your blockers. Make sure you move up to within the 10 feet line whenever your blocker goes for a block. The player in the back row on the cross has to pay attention for long hits from the hitter, this is a tough angle to defense but a tough angle to hit, too. 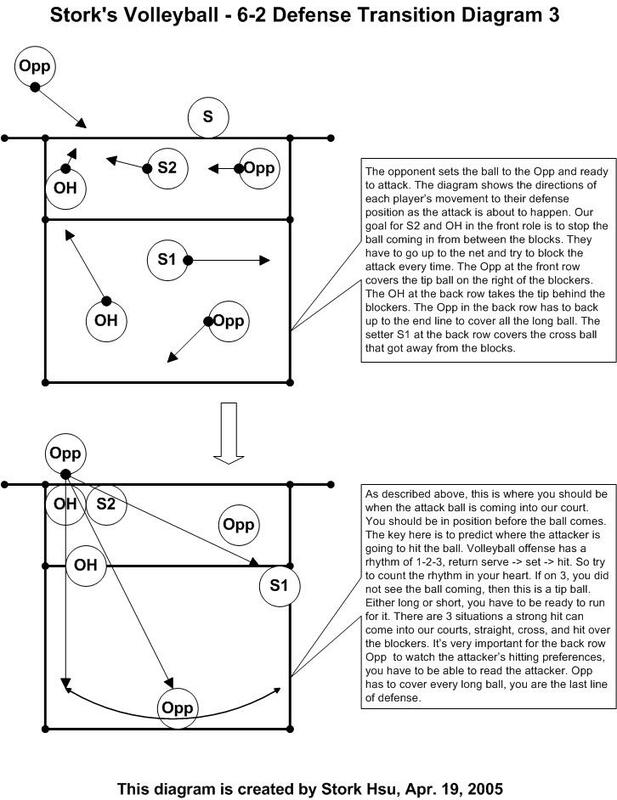 Please take a look at Defense Diagram for more details on the play. We play positional defense. The position changes happens at the moment of the serve when the team is playing defense. If the team is returning serve, then we stay for the first rally, we change to our designated position at moment we play defense. In positional defense, OH is always playing left, MH is always playing middle, and S/Opp always plays the right of the court. The goal for blockers is to keep the balls from being driven into certain areas of the court, — you are blocking a zone, and leave the rest to the defense behind them. Both sides covering the tips (either a back row player or the free front row player), must stay low and run after every tipped ball. This frees the back row center player to worry only about driven balls. Cross-court diggers must position themselves so that they can clearly see the ball and the attacker around the outside of the block. Middle back players must be prepared to run after any long soft/strong shots and the balls that got tipped off the blocker’s hands. Call free balls loudly and early. Free ball is your team’s best chance to get points. Move to the appropriate position quickly. Don’t relax on freeballs, pass the ball high to the setter, make sure the setter never passes the ball. ways to execute your plays. It’s very important to get your players to practice and know what they are good at and work on making your plays the strongest combinations of all. 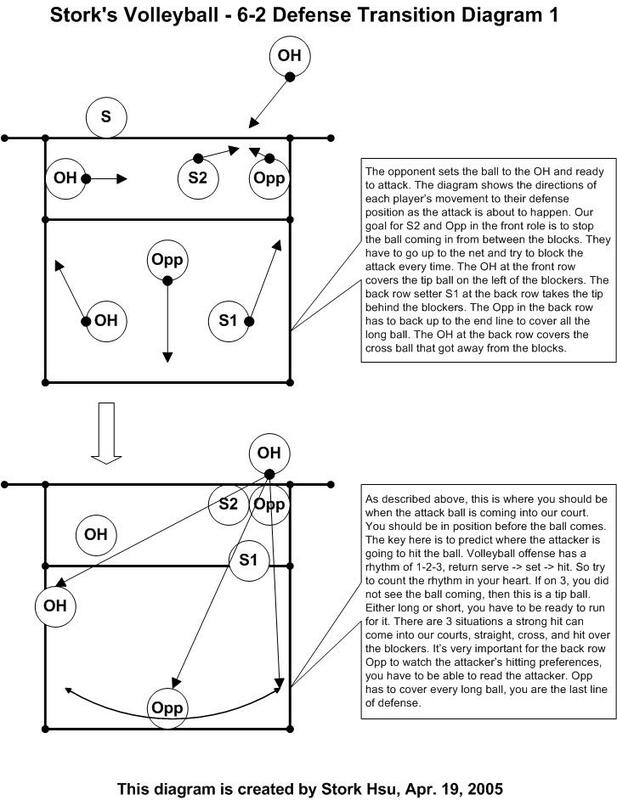 In theory, a 6-2 should remain the formation exactly like “Rotation 1” once the ball is served. The setter in the back row (Start with S1 in the back) is the one designated to set, not the one in the front row. Notice that after rotation 3, the formation is the same as the previous three. That’s because we use the same format for the front and the back row players. This should be easy enough. The advantage of using a 6-2 is we have 3 hitters at the front row, so we can do some combination attacks. 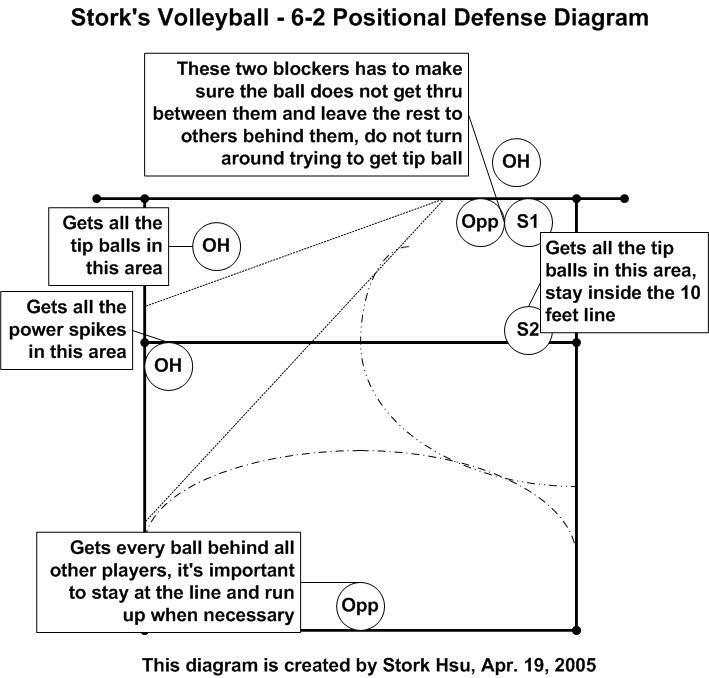 In a 5-1 situation, half of the formation would be the same when the setter is in the back row. But no switch is needed when the setter is at the front row, but then we only have two front row hitters.